You gotta love July for the garden produce. Re: You gotta love July for the garden produce. Wow, do I envy your garden! That is one fantabulous harvest you have there! What is the round yellow squash with the splash of green on top? It's very pretty, whatever it is. And are those apricots in that basket? I hope I can invest more next year. I have a feeling I won't have the same budget that I did this year. One can always dream though! I should have corn ready in the coming week or two. What is the round yellow squash with the splash of green on top? It's very pretty, whatever it is. And are those apricots in that basket? The squash is a volunteer hybrid. Yes, apricots. Yesterday we bottled a six gallon bucket full of green beans. Got 36 pints. Getting loads of summer squash. When you have a volunteer squash hybrid, how do you know when it is ready to pick? I had a squash plant come up where I once had a blue hubbard, but I do not recall ever dropping seeds there. It came up, it is vining out longer than a summer squash plant would, but it looks like a yellow summer squash. I have NO idea what the thing is. could it be a hybrid of a summer and a winter variety? if so, when would you pick that? It would be such a treat to grow corn, but it would require more space than I have AND a big tough fence. How long did it take for that pepper to get that big? Was that from seed? Thought is was about time for your abundant harvest. Your veggies always have such rich color, and come as ours are easing off. Great pictures. I am wondering if your veggie arrangements have some subliminal messages? Sheshshe, if it looks like a summer squash, pick it when it is small like you would a crookneck. Yes, summer squash will cross with some of the winter types and also pumpkins of the pepo type. 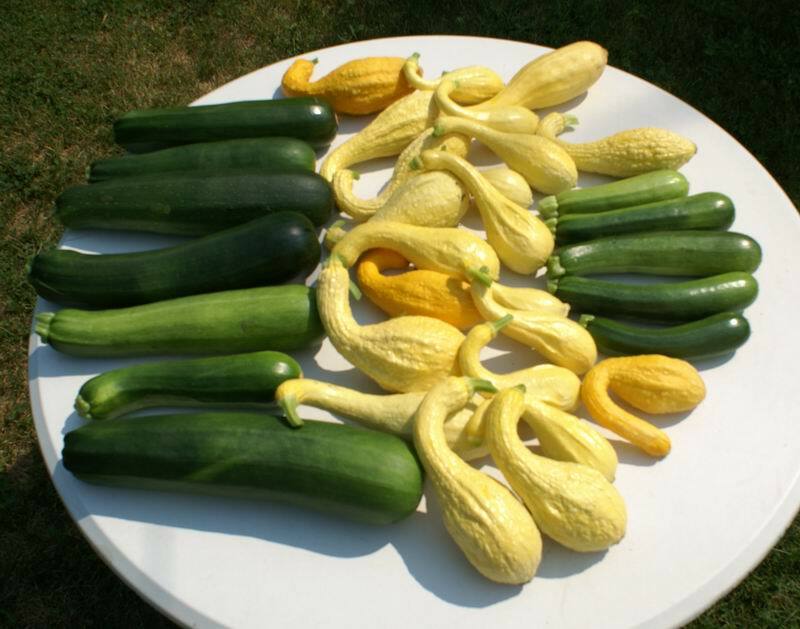 Zucchini and crookneck will not cross with Hubbard nor Banana though. I didn't eat that bi-colored weird squash, but it was fun to look at. I always buy starts for peppers and tomatoes. 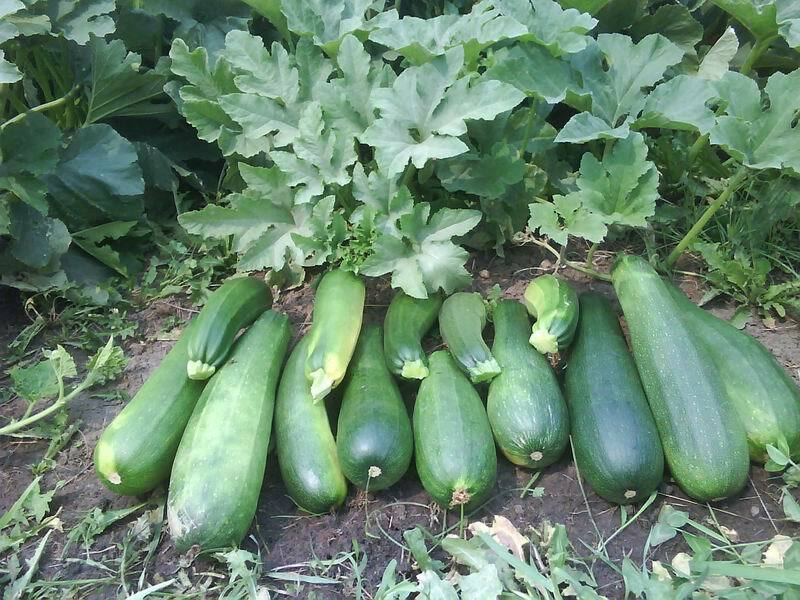 Wow, that is certainly an abundance of summer squash! Do you sell them at a farmer's market? I love all the pictures! It looks soooooooooooooo good! Ok, I'll pick it. it is shaped like a summer squash, but more fat. just weird. Is there anything you can do with the green onions to preserve them aside from chopping and freezing? ...or do they all get sold/eaten? Yes, I do sell at a local gardeners market. All those onions went to market this morning and I sold most of them. I have a few bundles left, wish I could pass them out to all of you. Green onions have been a good seller at market. I might mention the yellow ones went better at market today. I have not tried to preserve green onions. There are two kinds in the picture. Some are White Bunching Onion and they never make a bulb. The others are Yellow Spanish Onions and they will make a bulb. You can see they already have a bulb coming. Best thing to do here if you don't need the green onions is let them finish up and store them as dry bulbs. The bulbs get about the size of golf balls and down, from these onions planted from seed in April. The large onions in the picture: White onion planted from small plants in April. Yellow onions planted from sets in April. I am really liking these white onions. The yellow onions are better keepers.